This week, Camerimage film festival presents a retrospective of the films of Michael Powell and Emeric Pressburger. Last month at the Lumière Festival, Thelma Schoonmaker, the three-time Oscar winning editor and Powell’s widow, spoke about “The Tales of Hoffmann,” Powell and Pressburger’s 1951 adaptation of Jacques Offenbach’s opera, which is one of the films screening at Camerimage. Martin Scorsese has influenced generations of new filmmakers. But who and what films influenced Scorsese? 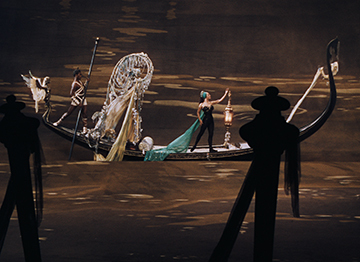 One front-runner: “The Tales of Hoffmann,” Michael Powell and Emeric Pressburger’s 1951 adaptation of Jacques Offenbach’s opera, which liberated the duo from the constraints of early 1950s’ sound cinema. In a video presentation made for and screened at the Lyon Lumière Festival in October, Scorsese admitted that he became “rather obsessed” by the movie. Starring Robert Rounseville as Hoffmann, Moira Shaerer in a double act- an automated doll Olympia and Hoffmann’s current love Stella, a dancer – plus the bolt-eyed Robert Helpmann and French dancer Leonide Massine, and featuring only dance and operatic song whose singers are identified in a credit roll reveal, “Tales of Hoffmann” was “written as a silent film,” Schoonmaker said. Thomas Beecham recorded the score. It was then played over loudspeakers in a big silent film stage. “That left Powell and Pressburger the freedom to do anything they wanted because they didn’t have to worry about sound,” Schoonmaker explained. She added: “My husband, Michael Powell, and the cameramen all felt free as in the silent days. A Technicolor camera was huge, with three strips of film running through it, because they needed a blimp to cover the sound. On this movie they could take it off, and the camera could fly! Restoring the movie, she came to understand why Scorsese was so obsessed by the movie. “So this film is in Martin Scorsese’s DNA,” she concluded to appreciative applause. “The Tales of Hoffmann” was indeed watched by an entranced audience in Lyon. If it weren’t for the music, you could have heard a pin drop in the house.